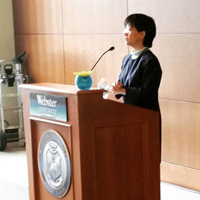 Huang shared insight from her career and spoke of the value of service. The Webster Staff Alliance annual Professional Development Day on Thursday, March 10, was a success with a variety of informative sessions for attendees in person at the home campus in Webster Groves and those from other campuses who viewed several sessions via Webex. Webster University President Elizabeth (Beth) J. Stroble opened the luncheon with words of encouragement and support for staff, and thanking WSA leadership on their continued work and development of Webster’s staff. Sessions were offered in the morning and again in the afternoon on topics such as: communications, stress relief, leadership, diversity and more, presented by Webster colleagues. The six, 50-minutes workshops offered attendees the opportunity to hone their professional development skills in a number of unique ways. In addition to the annual and useful stress management and resume building tactics, there were some new topics intended to change the way we think, approach, react and interact during our work and in day-to-day communication with colleagues. Huang's keynote highlighted WSA Professional Developmet Day. Between the morning and afternoon sessions, the keynote luncheon featured Hsin-hsin Huang, curriculum director for the Department of Professional Counseling in the College of Arts & Sciences. Huang shared some of her experiences growing up and finding a career path of her choosing and passion despite family and cultural pressures. She spoke of "Purposeful Service: Intentionality in the Workplace," where each and every one of us has a duty to follow moral and personal compass and to contribute to the betterment of those we service. 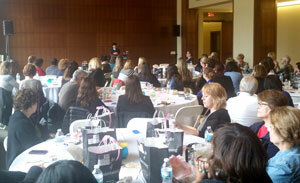 Recordings of select sessions are available at the Professional Development Day page. The WSA Board is also looking for your feedback about the event and suggestions for next year. Submit your input through this brief survey. The WSA is also seeking nominations for board positions whose terms end May 31. Find the nomination form here; the nomination period is open until April 6.